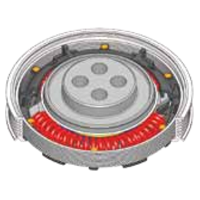 Litens Automotive Group’s patented TorqFiltr crankshaft vibration control technology uses an arc spring isolator mechanism to decouple the accessory drive system inertia from the engine torsional vibrations. To determine the magnitude, location and direction of the action-reaction forces and stress and deformation/deflection on each component and to investigate the contact mechanism in order to achieve an optimal design. Marc accurately predicts how the design behaves, how components move and react against each other and what happens under dynamic loading conditions.